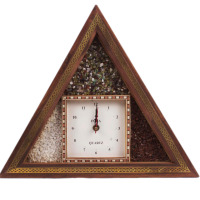 Calendars and clocks exist to measure time, but that signifies little as we all know that an hour can seem as eternity or can pass in a flash depending on how it is spent. 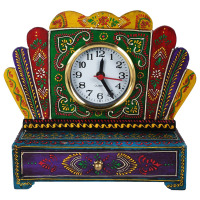 Beautiful handmade Rajasthani clock not only realizes you what time it is, but it also signifies the importance of well spent time in its own. 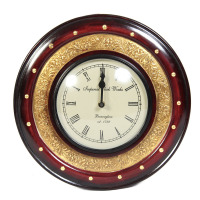 These beautifully handcrafted clocks serve a decorative purpose as well and can be gifted to your close ones. Rajasthan is a majestic place. With it breath-taking heritage, colorful and glorious traditions, cultures and stunning handicrafts, it is no doubt the central hub of art and tourists not only for India but also for the whole world. Rajasthan is a vast state with many cities unique for their own special arts having no parallel to them. They carve these items with their own hands, and this skill runs in their veins from generations. 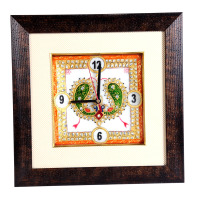 Modifying their skills and adding new designs according to customer needs has evolved their handicrafts. Today we don’t see just traditional items. Instead, they have beautifully merged their traditions with evolving skills, which had made them successful and unique. The decoration is still the basic purpose of their art. Making things that suit your personality, give you pleasure and a sense of completion to your homes, yet connecting you to your ancestors and traditions. 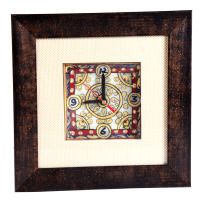 Different kinds of wall hangings are used as decoration purposes according to one’s taste and aesthetic preference. What you like, others may dislike. A good decorative item must be eye catching, simple yet delicate and captivating, must be liked by all and useful as well. Rajasthani handicrafts provide a wide range of decorative items including beautiful statues of Buddha, Ganesh, Baal krishn etc. 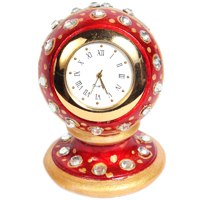 designer wooden and metal candle holders, decorative wall hangings and photo frames, key holders, dry fruits boxes and stunning wall clocks. 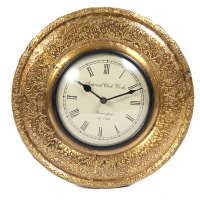 Among these decoration clocks are essentially the most common items used in all the houses. 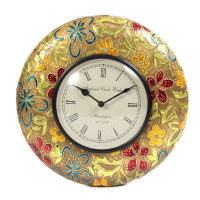 But with these traditional and designer handmade Rajasthani clocks looking time becomes delightful and they serve a decorative purpose as well. These can be gifted to your family members, relatives, colleagues, employees or at a wedding or any occasion like Diwali and Holi so that they remember you every time they look at them. 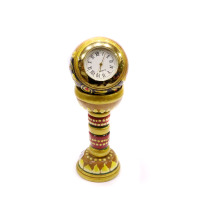 These beautiful clocks made of best quality and eco-friendly material are ideal decoration addition to your bedrooms, living rooms, lounge, etc., to spark your life with a traditional Rajasthani look. 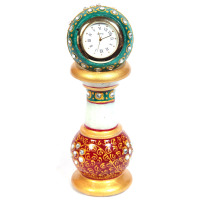 Our artisans carve these masterpieces from best quality wood, colorful and durable brass and fine marbles and further embellished with beautiful embroidery, meenakari and precious stones, beads and gem work. All done neatly and skilfully by hands. 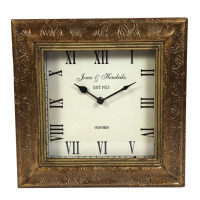 These clocks hung on your walls not only serve the decorative and time telling purpose but also gives your house a traditional look. 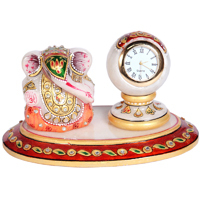 Our special marble statue clocks including oval Ganesh and pillar watch and traditional and designer marble pillar clocks with stunning Meenakari take less space, no need to drill your walls then also it will look beautiful too, and are highly in demand. 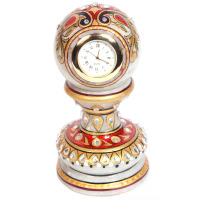 Other varieties include beautiful traditional Meenakari marble clocks, round and square wooden and brass clocks and much more. 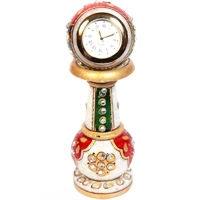 Boontoon.com is the largest online shopping center of Rajasthani handmade items. 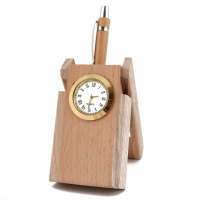 Our items because of their exceptional quality, designer approach and best prices are highly praised and demanded items worldwide including India, UK, USA, Australia, etc. 100% handmade, timely delivery and customer satisfaction is our pride. Bulk orders are also supplied in all parts of the world.